– Art and meditation enable one to become more open towards the unconscious. Both give expression to voices that are not easily heard in our habitual everyday routine. Many artists receive inspiration from meditation, says Eva Skaar, Norwegian painter and instructor in Acem Meditation. Eva Skaar’s exhibition in a well known Oslo gallery this autumn was a great success. People agree that her paintings have become brighter, more open, using a wider range of colours. She herself attributes some of the changes to her meditative process. After 14 years she stillpractices Acem Meditation twice a day, half an hour each time. – Both art and meditation are related to intuition, she says. ‑ They are not something that you produce or understand with your head. You have to throw yourself into the process. Striving to achieve specific results will get you nowhere. You have to let go of your conventional conceptions of what is good and bad and create a space for your own spontaneity. In painting as well as meditation, Eva Skaar is inspired by the con­cept of a “free mental attitude”, taken from the psychology of meditation developed in Acem. A free mental attitude involves openness, mental presence and acceptance ‑ the opposite of discipline and cleverness. ‑ The challenge, she says, is to establish a contact inwards, a sort of mental connection. From time to time you achieve such a connection. You feel inspired. Your sense of time changes. Ideas start to flow more easily. Creative blocks loosen. ‑ But there are also periods when you feel you do not succeed. Any­thing that is really new needs time to reach the surface. In the mean­time you feel blocked. It’s difficult to accept, but it’s part of the process. Eva Skaar smiles when she de­scribes such periods. ‑ I work inten­sely for a whole day, manage to paint a few strokes, but then cover them up again with new strokes the following day. It is easy to feel that this is a waste of time. But that’s not true. You cannot measure uncon­scious processes along usual dimensions of efficiency. Periods of struggling, fumbling and feeling confused are a prerequisite for renewal. Without them art easily becomes slick artiness without a genuine inner foundation. ‑ Resistance is a part of the meditation process as well. The daily half‑hours sometimes feel difficult. We become restless. Something from the unconscious is approaching the surface, and we do not know what it is. If we skip our meditations during such periods, we are letting our counterforces win ‑the forces that want everything to remain as it is. If we persevere with our regular meditation habits despite the resistance, however, we will gain a valuable opportunity to work through something that might gradually give us new insight into our own lives. Eva Skaar emphasises the importance of creativity: ‑ If you stand in front of a canvas wondering how you can repeat the successes of the past, then you are no longer creating, just copying. The same applies to Acem Meditation. The challenge is to create as much freedom as possibl for all the various thoughts and feelings that pass through the mind. If you think you have really been successful one day, this is of little help the next day. The free mental attitude has to be created anew all the time. ‑ Many artists feel that meditation is a profound source of inspiration. The simple technique provides instructive models for creative work. By giving an unusual degree of freedom to spontaneous thoughts, feelings and fantasies, it lays a solid foundation for a more creative imagination. It also makes it easier to let go of your hang‑ups during periods of resistance. 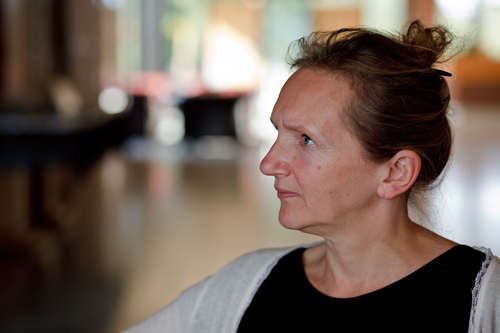 For me it has become an indispensable tool ‑ in my life as well as in my art, says Eva Skaar.